Happy New Year! In the words of my blogger friend, Nina Safar – 2015 will be “EPIC”. This recipe is a great one to start the new year because it is packed with flavor, but not with calories! This is one of my favorite foods because of its flavor, and though many households do not have a rotating spit, it is fairly easily to replicate. Adding the right combination of spices and grilling it on very high heat to achieve a char on the protein is the key to making it taste like the ones you remember. Create a spice mixture by combining all spices together. Liberally season (*You will have some left over. Label and keep some for another protein to try.) all boneless, skinless thighs and allow to sit for about 5 minutes. Meanwhile, slice the onion and reserve. 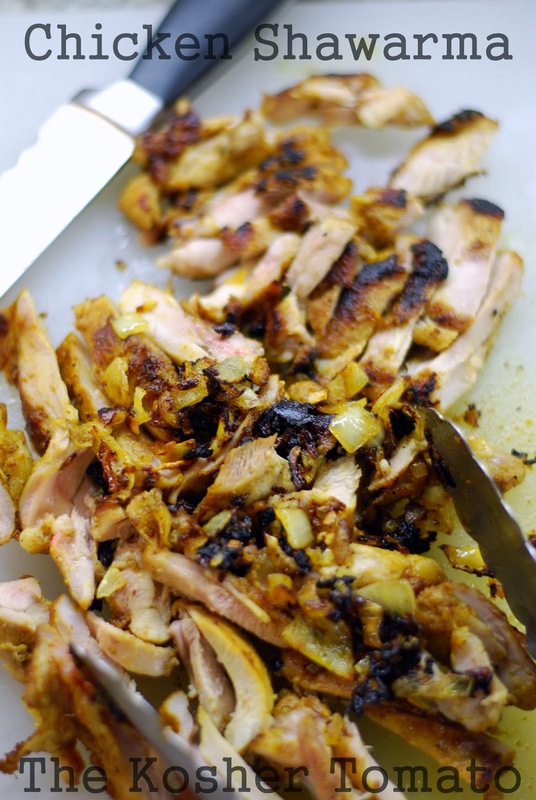 Get a grill pan hot FIRST, then add a bit of Pam spray or olive oil and arrange your chicken evenly so it does not crowd the pan ( this is essential so the heat circulates throughout) Place sliced onion on top so the juices trickle down. Allow to cook on one side for about 5 minutes. **The chicken will easily lift off with your tongs once ready to flip! Once flipped, scatter onions throughout the pan and allow the other side to cook. Lower the flame, and finish cooking the onions to your liking. (I like to get dark color for optimal flavor) Remove chicken from the flame and after about 5 minutes or so, slice thinly on a diagonal. 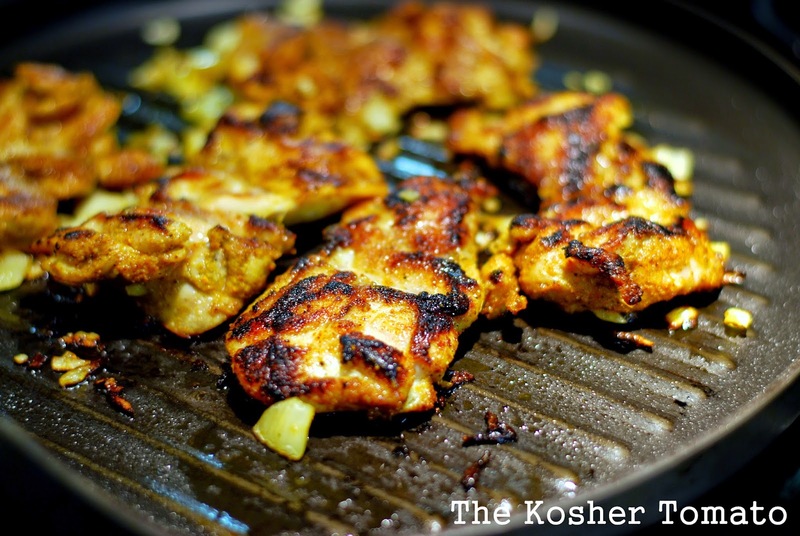 Serve with onions on top of rice, next to roasted potatoes or traditionally in a pita with your favorite fillings! The commercial establishments that make shawarma use either very fatty pieces of meat, or pack extra fat between the pieces of meat. A local restuarant which makes lots of chicken schnitzel and chicken soup needs to trim off tons of chicken fat, and he then sells it to a local shawarma and falafel place that places it between the layers of meat. I think you would get a more shawarma like effect at home by adding oil or some other liquid while grilling the meat. Feinschmeckers anonymous: Thank you for commenting! 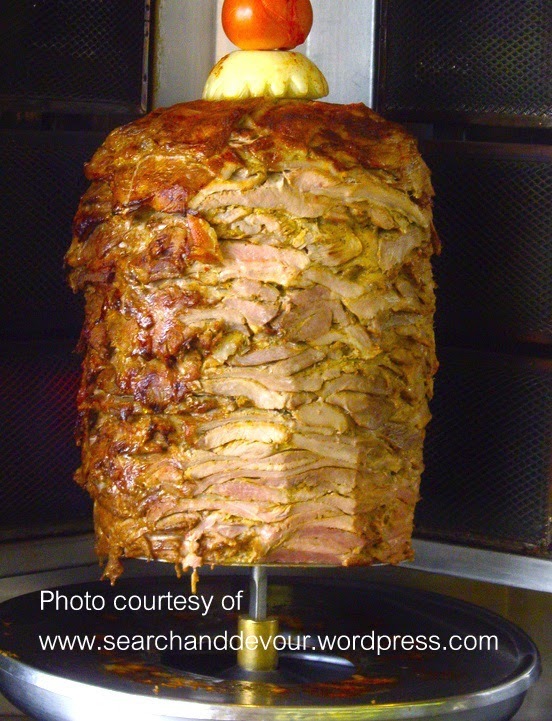 I agree, the typical shawarma we know is very fatty – which makes it super delicious. One could use (Shmaltz) chicken fat in the pan instead of olive oil, but I chose to keep it on a lighter side. I assure you that by using chicken THIGHS instead of chicken breasts, it does give it a little extra fat and delicious flavor. Happy cooking!